Let's visit Glastonbury, a town associated with the legendary King Arthur and the Holy Grail. From the Middle Ages through today, Glastonbury has been a center for mystical beliefs. Glastonbury is a town in south-western England. It plays an unusually prominent role in history and modern culture despite having only about 9,000 residents. Glastonbury is in a low-lying region called the Somerset Levels. This area is mostly wetlands draining into the coast of the Severn, the long tapering bay separating Somerset from Wales. A few isolated hills, most prominently the Tor of Glastonbury, rise out of the low wetlands. The area has been inhabited since Neolithic times. In the 1100s it came to be associated with the legendary King Arthur. The prominent conical hill called the Tor was later theorized to be the Isle of Avalon, effectively an island rising above what now is wetland and was open water in times of higher sea level. Glastonbury has been eccentric ever since, Now it is a center of New Age beliefs. Glastonbury is south of Bristol and southwest of Bath. On a more local scale, it is between Wells and Street. See the maps here and below. 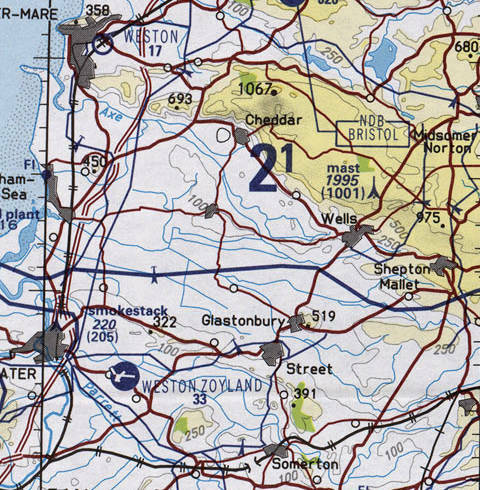 For your own portable local maps, get the Ordnance Survey Explorer Map #141 (Cheddar Gorge and Mendip Hills West) or Landranger Map #183 (Yeovil and Frome). There is daily bus service between Bath and Glastonbury, taking between an hour and an hour and a half. The Bath-Glastonbury bus runs infrequently, something like once a day but not at all on Sundays, so plan ahead! Bus number 376 connects Glastonbury to Bristol every hour during the day, the #376 is much more useful for getting to and from Glastonbury. See the First Group bus company's site for schedules. You can easily get as far as Bath or Bristol by train or coach. Note that "coach" is the British English word for what North Americans would call an inter-city bus. Glastonbury is close to the center of the Somerset Levels. The Tor just outside Glastonbury rises to 519 feet or 158 meters, making it the tallest point within the Levels but just about half the height of the ridge along its northern edge, just beyond Shepton Mallet, Wells and Cheddar. Street is a slightly larger town with a population of about 11,000. It is just about a mile away to the south of Glastonbury. Sea level rose during the 7th millennium BC, flooding the lowlands of the Somerset Levels. Mesolithic people established some seasonal camps on higher ground. The Neolithic people continued living in the area, building wooden trackways linking their settlements around 3800 BC. By the Bronze Age there were larger settlements including a village about two miles west of present-day Glastonbury. It was built about 300 BC and occupied until around 100 AD in the Roman era. The village was about 120×90 meters in size, with about 100 residents. The terrain was swampy, so they built their village on an artificial foundation of timber, brushwood, and rubble. Glastonbury Abbey was founded in the 7th century. There are legends that Glastonbury was a religious center in Celtic or even pre-Celtic times. Another set of legends of recent invention claim that Joseph of Arimathea brought Christianity to Britain by founding a church here in the 1st century AD. Romano-British pottery has been discovered at the west end of the nave. However, there is no evidence for Christianity or any other religion before the 600s. The Roman era pottery simply was left there by the Bronze Age inhabitants of the area. The Saxons invaded the area in the mid 600s, taking Glastonbury in 658 after the Battle of Peonnum. This battle saw the West Saxons under Cenwalh defeating the Somerset Britons and gaining control of Somerset as far west as the River Parrett. The abbey was already a valuable prize, perhaps at least partly behind the Saxon strategy. The West Saxon leader Cenwalh allowed Bregored, the British abbot, to stay in power. Bregored died in 669 and was replaced by the Anglo-Saxon monk Berhtwald, but British monks remained at the abbey for many years. King Ine of Wessex supported the religious community at Glastonbury, directing the construction of a stone church in 712. Its foundations form the west end of the nave. As we will eventually see a few pages ahead, Glastonbury Abbey ended up being a large complex of ruins being picked over for useful building material. 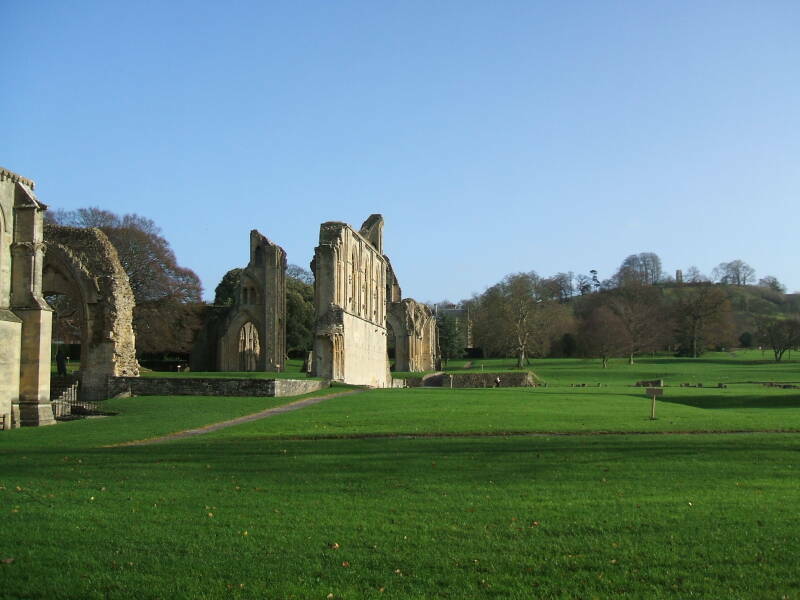 The ruins of the abbey were purchased by the Bath and Wells Diocesan Trust in 1908. The trust appointed Frederick Bligh Bond to lead an archaeological study of the site. But he was dismissed by Bishop Armitage Robinson in 1921 because of his reliance on seances and psychic archaeology. Danish marauders came through the area in the 9th century, rampaging through the abbey and the surrounding community. She was in the church of Saint Mary on Candleday, when all the lights were suddenly extinguished. Then the candle held by Cynethryth was as suddenly relighted, and all present lit their candles at this miraculous flame, thus foreshadowing that the boy "would be the minister of eternal light" to the Church of England. Details are sketchy and contradictory, but it seems that Dunstan was born around 910 or earlier. Irish monks occupied the Dane-ruined abbey, Dunstan studied with them when he was a young boy. He served in the church, eventually being summoned to service for his uncle, who had become the Archbishop of Canterbury. That led to his appointment to the court of King Athelstan, King of the West Saxons 924-927 and King of the English 927-939. Dunstan became a favorite of the king and that led to other members of the royal court envying him. They accused him of witchcraft and black magic. The king ordered him to leave, and on his way out Dunstan's enemies beat him severely, tied him up, and threw him into a cesspool. Dunstan made his way to Winchester and entered the service of his uncle Ælfheah, the Bishop of Winchester. His uncle was trying to persuade him to become a monk when Dunstan decided that he was receiving a message in the form of "swelling tumours" all over his body. This was probably some form of blood poisoning caused by the beating and immersion in the cellpool. However, the episode convinced him to become a monk. 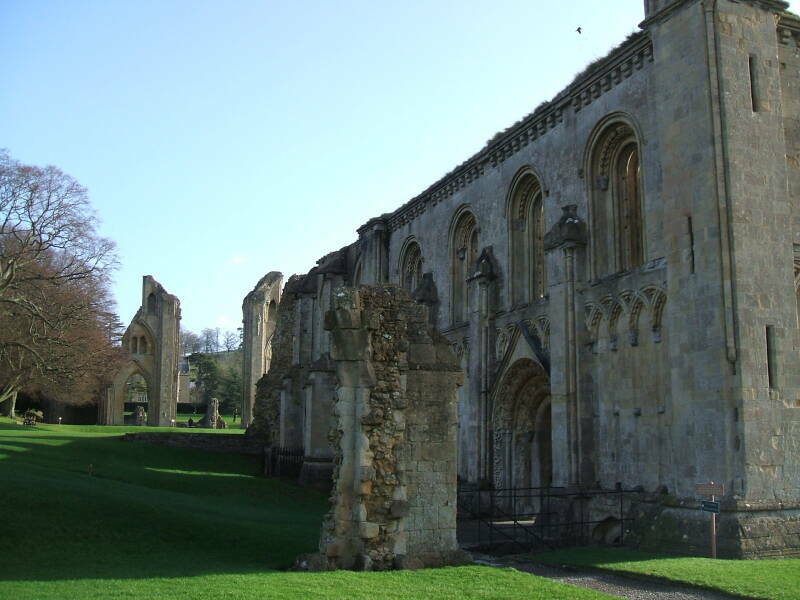 Dunstan took the Holy Orders as a monk in 943, and returned to Glastonbury Abbey to live as a hermit. He built a small cell five feet long by two and a half feet wide against the exterior of the old church of Saint Mary, where he studied, worked on handicrafts, and played his harp. He also worked as a silversmith and in the scriptorium. Dunstan became renowned for his skills as a musician, manuscript illuminator, and silversmith. King Æthelflaed, the niece of King Æthelstan, made Dunstan her highly trusted personal advisor. She died and left a significant fortune to Dunstan. His father died around the same time, also leaving his fortune to Dunstan. Dunstan used his inherited wealth to lead a revival of monastic life in Britain. King Æthelstan died in 940, and the new king, Edmund, summoned Dunstan to serve as a minister at his court at Cheddar. This led to Dunstan's royal appointment to the office of Abbot of Glastonbury. He established Benedictine monasticism at the abbey, and then began a re-building program. He started with the Church of Saint Peter, then rebuilt the cloister and the monastic enclosure. 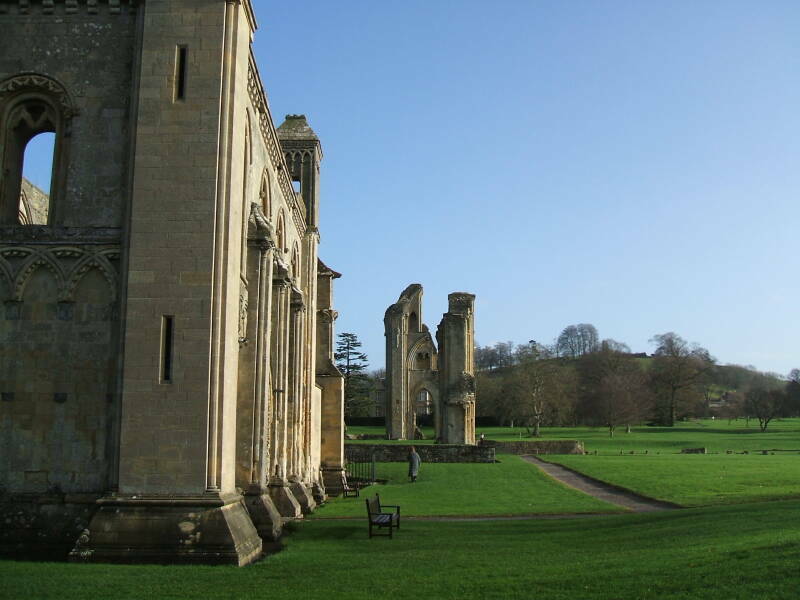 The community benefited, as the newly founded school for youth became the most famous of its time, and the abbey extended the irrigation and drainage system on the surrounding Somerset Levels. There were successions of kings, some favorable toward Dunstan and some not. After fleeing to Flanders for a while, avoiding English regal fury and seeing how Benedictine rule worked on the Continent, Dunstan was recalled to England and made Bishop of Worcester at the end of 957. He added the office of Bishop of London the following year. In 960 Dunstan was named archbishop and traveled to Rome to make it official. On his return he held power close to that of prime minister of the kingdom. The king supported Dunstan's push for reform of the English church. Dunstan enforced the rule of celibacy as much as was possible for him, and monks were taught self-sacrifice. He prohibited selling ecclesiastical offices for money and the custom of clerics appointing their relatives to offices under their control. Parish priests were required to be qualified, and urged to teach their parishoners practical trades to improve their lives. Secular state reforms paralleled these ecclesiastical ones. King Eadweard was assassinated at Corfe Castle in March 978. The ominously named Æthelred the Unready became the king, and Dunstan was out of a government position. He retired to Canterbury, where he worked to establish schools, defend widows and orphans, and promote peace. He made bells and organs and worked to correct and improve the library's holdings. Dunstan died in 988 and was buried in the Canterbury cathedral in a tomb on the south side of the High Altar. In 1012 those pesky Danes were back to sack Canterbury. The monks at Glastonbury later claimed that Dunstan's body had been miraculously carried to their abbey's great church for safekeeping. But in 1508 William Warham, Archbishop of Canterbury, opened Dunstan's tomb and found that his relics were still there. Shortly after that, in 1539, Canterbury surrendered in the Dissolution of the Monasteries, part of the English Reformation, and Dunstan's shrine was destroyed as the cathedral was converted to "a college of secular canons". The Normans invaded Britain in 1066, and Glastonbury was a valuable prize. The Domesday Book was compiled in 1086 as an inventory of what William the Conqueror now controlled. 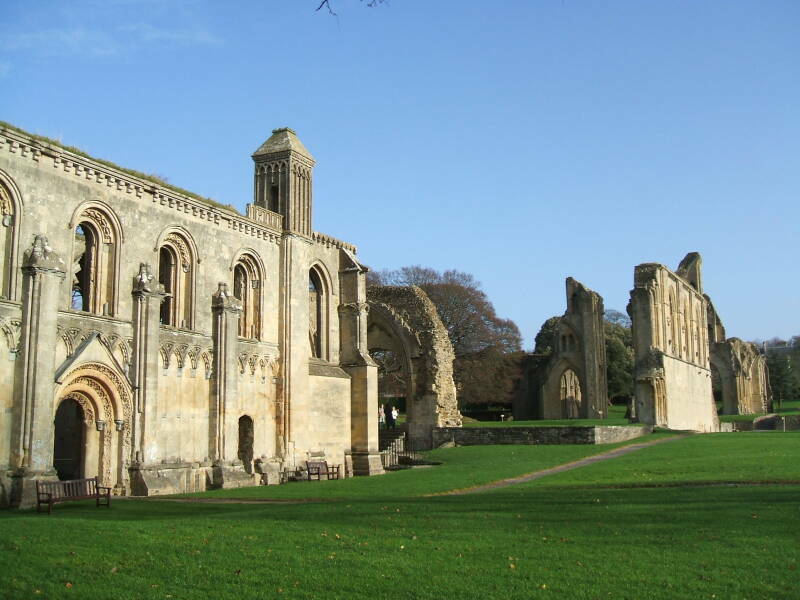 Glastonbury Abbey was listed as the wealthiest monastery in England.